The Stone Cottage is a picturesque old world dormer house in a countryside setting at Raycoslough, Blackwater between Sneem and Kenmare on the famed Ring of Kerry route. It has been lovingly restored to preserve its character and furnished with care. It is 10 miles from Kenmare and 20 miles from Killarney in a very picturesque area of Kerry. It is adjacent to the Blackwater Tavern, with music and set dancing every Friday night and the occasional traditional Irish music session. The Blackwater Tavern also incorporates a grocery store, a post office and a petrol and diesel station. 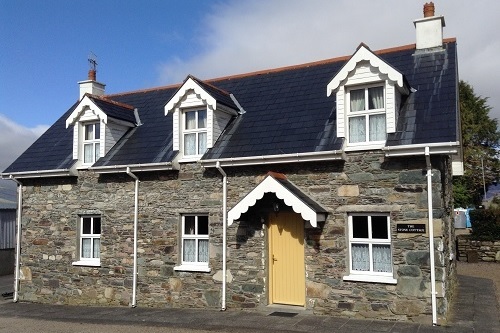 The cottage is a 45 minute drive from Kerry Airport and a 90 minute drive from Cork Airport. It is ideally located just a few miles from the scenic Ring of Kerry Golf and Country Club with an 18 hole golf course and stunning views over looking Kenmare Bay. Fishing, horse riding and walking are all activities which are available locally. The Kerry Way one of Ireland's longest signposted walking trails and also one of the most popular, passes through Blackwater.